These gorgeous wrappers come in several designs at www.fancyflours.com. 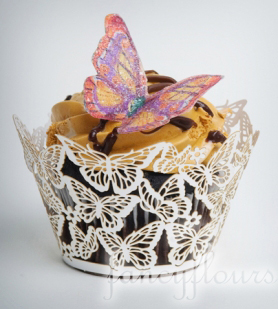 The butterfly design (above) is absolutely stunning with the wafer paper butterfly placed on top! Check out the full line of cupcake wrappers including choo-choo train, princess, daisies, baby and many others, sure to be a hit at your next gathering! These unique wrappers are easy to use and a fun way to dress up any ordinary cupcake. Needing even more pizazz? Be sure to browse our wafer paper collection. 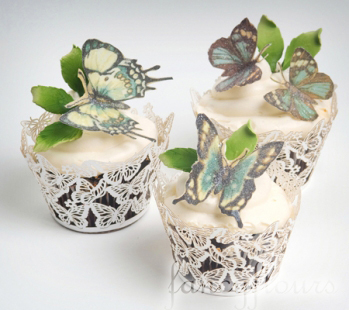 Wafer Paper is an edible starch-based paper that can be printed or stamped on with edible ink or bought with the design pre-printed (like the butterflies shown above). Cut out the design and affix to cakes, cookies, cupcakes, and desserts with just a dab of corn starch on the back side. You can also add even more glam to your wafer paper cut-outs using edible glitter or dragees; all sold at http://www.fancyflours.com. In no time you will have amazing treats that only took you moments to prepare! For our complete selection of Cupcake Wrappers please visit us at our online store: http://www.fancyflours.com. This entry was posted in Baking Inspiration, Cupcake Recipes & Ideas, Spring Baking by Fancy Flours. Bookmark the permalink. Where do you get wafer paper? where can i get the cupcake wrapper in singapore and how does it cost? What is yr cupcake wrapper and liners made of? Those are the most elegant cupcakes I have ever seen. Congratulations on your creations! Would like some information on your cupcake wrappers (Cost and how to order). I live in Perth, Western Australia. I love your cupcake papers and all your other wonderful ideas! I am a pastry chef and would like to know if you offer them at a wholesale price in larger quantities for my bakery. Thank you for your wonderful catalog and I will miss your beautiful store, it was truly unique! I love your butterfly cupcake wrappers!! Where/How do I order them? Our Cupcake Wrappers are available for sale online at http://www.fancyflours.com. Bulk pricing is available on select cupcake wrappers. Please call fancyflours.com for pricing information. 406.587.0118. Fancy Flours Cupcake Wrappers are available for sale online at http://www.fancyflours.com. Bulk pricing is available on select cupcake wrappers. Please call fancyflours.com for pricing information. 406.587.0118. I am interested in buying some of your cupcake wrappers in various styles.. Could I get a catalog please?